The MAXIEM 1515 delivers high performance in a compact package. With an ample cutting area that easily fits up to 5′ x 5′ (1.5 m x 1.5 m) material stock, the 1515 is an excellent fit for fabrication and job shops. The highly efficient MAXIEM Direct Drive Pump delivers the highest nozzle horsepower in the industry for faster, more efficient cutting. The advanced Windows® 8 controller features a large 23″ (584 mm) screen for easy viewing of part files and tool paths and comes with the powerful Intelli-MAX® Software Suite ready to use. With the most compact machine footprint in the MAXIEM lineup, the 0707 is perfect for the smaller job shop or research facility for prototyping, short production runs, or small-scale projects. The MAXIEM 0707 features the lowest ceiling height requirement in the industry, while the constant and continuous feedback from the 1-micron linear encoders on the X-Y drive system ensures precision and speed. 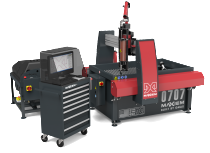 The 0707 is powered by the industry-proven Intelli-MAX® Software Suite that is backed by over 20 years of abrasive waterjet research and innovation. With the OMAX Mobile JetMachining Center, the OMAX Corporation meets the specific requirements of the oil field maintenance, high-rise steel construction, shipbuilding, commercial industries supporting government programs, and any other commercial businesses needing to easily transport waterjet equipment on a regular basis. Essentially, the extremely durable and reliable system is a transportable abrasive waterjet shop mounted to a steel base with forklift access points, so the entire system can be quickly and easily moved.